I finally finished half of this massive project. Here’s the first of two quilts that I’ve named Pinwheels & Postage Stamps. But when you say it, you should really sing it to the tune of this song…. Ok, are you sufficiently perked up? Great! Let’s talk about quilts! These are half square triangles turned pinwheels using Kona Ivory and the entire collection of Folksy Flannels (from my favorite Anna Maria Horner). I also purchased two spectrum bundles of solids from her shop, so those are mixed in to highlight the prints. It is sashed with a soft linen/cotton blend and bound in Farmdale Crosshatch in sage. The backing is also the folksy flannel. I really couldn’t be more pleased with the way that this turned out. In order to keep this as soft and cuddly as possible, I opted for a very light quilting style. I quilted a meandering spiral/paisley pattern into each individual white sash. I used coordinating sashiko threads, pearle cottons and embroidery flosses to hand quilt running stitches around random pinwheels. This is the first real project I’ve worked on with my new Bernina 440 QE. I’ve only had it for about a 1.5 months but it has totally changed the way I sew. I was sewing on an awesome old 1950 Singer Slant-o-matic. Amazing to learn on, but after finishing 8 quilts (piecing and quilting!) and a ton of little side projects I was sewing at least an hour daily. I started researching several months ago and after much consideration, I marched myself down to Modern Domestic over on Alberta Street. They are so awesome, couldn’t be more thrilled with the amazing customer service and support I’ve already received from Lupine, Meredith and the other lovely ladies of MD. I chose the 440 QE specifically because the BSR or Bernina Stitch Regulator, was included in the package. It’s a pretty amazing foot, with an equally amazing price tag. It took some getting used to, and it meant working slower than I usually do, but I love it! My stitch length was consistent throughout the entire quilt. Le sigh. It makes me so happy to see such a huge improvement in the quality of my sewing on a new and versatile machine, so encouraging! inventory for an etsy shop in the works. I never would have guessed when I decided to leave the kitchen that I’d find a small means of employment with this hobby. It is such a welcome, sanity saving outlet for me to creatively function beyond the role of Mom. My former inner work-a-holic has not had the easiest transition from 45-60 hr work weeks to SAHM. Almost 15 months in and it feels like we are confidently comfortable in our families new normal. 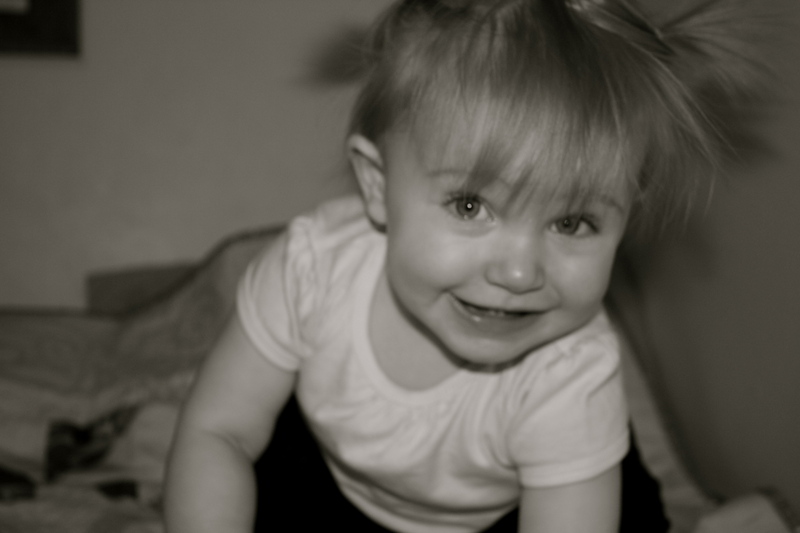 This little smile is just the icing on the cake:) Have a wonderful week. I’ll be back with some picture heavy posts of pretty fabric stacks and a sinful chocolate chip cheesecake bar recipe. 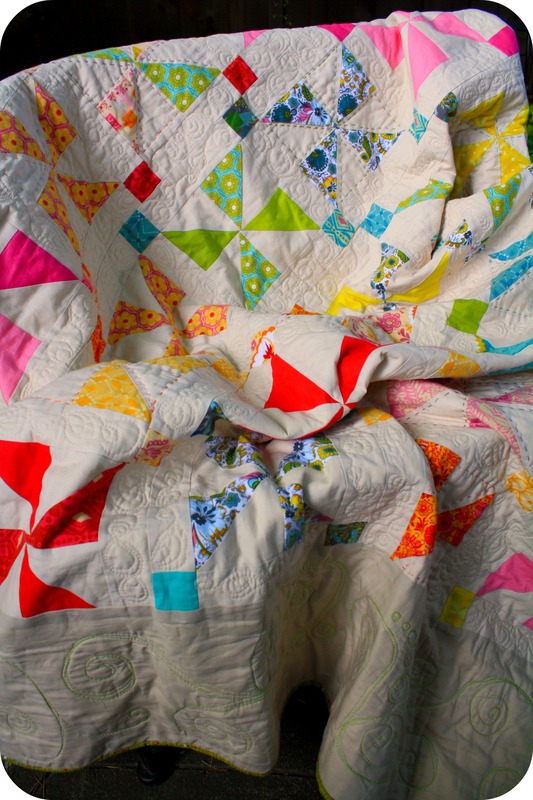 This entry was posted in Bernina 440 QE, Bernina Stitch Regulator, embroidery, patchwork, Quilting, sewing and tagged anna maria horner, folksy flannels, freemotion quilting, half square triangles, hand quilting, HST, modern quilting, quilting, sewing. Bookmark the permalink. That I can do! I need to come in soon anyways. Those rufflers are calling my name:) Thanks for putting my little old quilt up on the MD page, I was just tickled to see it there this morning. Enjoy this beautiful day! 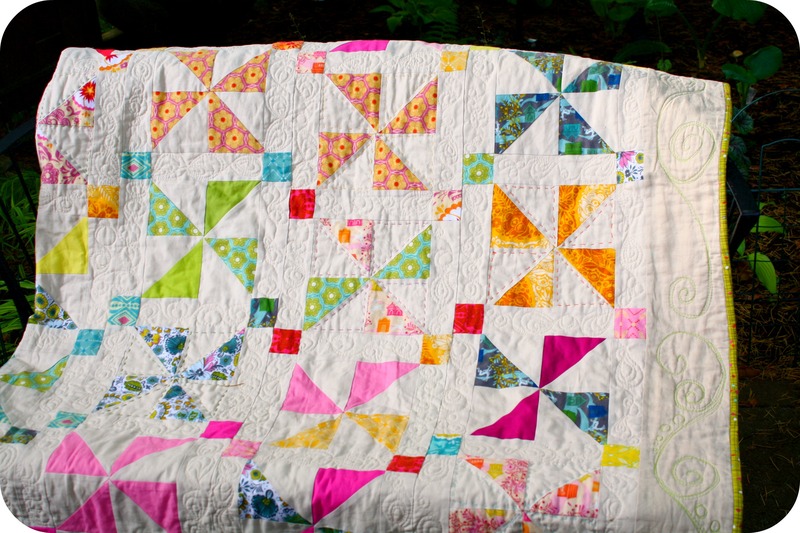 The pin wheel quilt is just lovely! 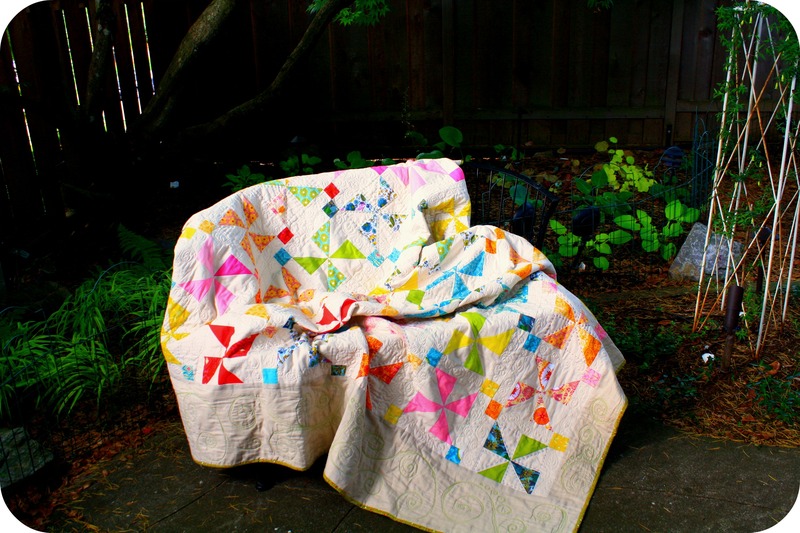 I love how you quilted it – yay!